A businessman’s five-year-old son, abducted on Wednesday while playing outside his west Delhi home, was found strangled on Saturday in a rented house in the neighbourhood. Street children, child labourers, human trafficking, women’s rights...the causes that Indian civil society groups espouse are many. And, in the New Year, they are brimming with new ways to help this country’s billion plus people. Lt-Governor Tejendra Kahnna’s direction for random checking of identification of Delhi citizens received mixed reactions from the people of different strata of society. A section says that it may be a tool of harassment for policemen while others take it as a check of unwanted elements in the national Capital. There is an escalation in the threat perception of Maninderjeet Singh Bitta, president, All India Anti-Terrorist Front, according to Punjab intelligence report and the security provided to him needs to be continuously reviewed. Four members of a family, including two women, were ruthlessly beaten up by some unidentified men, who barged into their North West Delhi home and fled with Rs 6,00,000 and jewellery, the police said today. Chief Minister Sheila Dikshit today launched a national immunisation drive (NID) to make India polio-free, from her residence in the Capital. Elaborate arrangements have been made in the Capital for administering anti-polio drops to over 28 lakh children between the age group of 0-5 years. The Central Bureau of Investigation (CBI) today arrested Gurcharan Singh, assistant director (Housing MIG) of DDA and G.S.Raju, Pollution Test inspector, Transport Authority while accepting bribe. The sixth Pravasi Bharatiya Divas (PBD), the annual conclave of the Indian diaspora, will focus on the increasing cases of exploitation of Indian women, after getting married overseas as well as on overseas Indian workers at its January 8-9 meet here. UP Chief Minister Mayawati is set to ignore another jinx as she is visiting Greater Noida on January 15 when she is scheduled to address a public meeting on a ground between Jaganpur and Amarpur villages in the afternoon. Apart from inspecting the progress of work in GB Nagar University, the Chief Minister will also lay the foundation stone of Ganga Expressway. Armed robbers, who got the door of the house of a leading trader in Hapur opened on the pretext of delivering a New Year gift, decamped with Rs 12 lakh from his house within a few minutes, on Thursday evening. A nine-year-old boy Abhilash, who was kidnapped 19 days ago from Nehru Enclave here, has been released after the police exerted pressure on his abductors, officials said. He churned out the maximum hits last year, and, is now charging more than Rs 200 million (Rs 20 crore) for a film. However, trade analysts feel despite his achievements and consistency, Akshay Kumar is far behind Shah Rukh Khan in the race for superstardom. A criminal detained in Surajpur police station for loot and assault escaped from the police custody on Friday morning by hoodwinking the cops. In spite of police’s best efforts, the criminal could not be nabbed again. The Gurpurb, marking the 342nd birthday of Guru Gobind Singh, the tenth Sikh Guru was celebrated in Sector-18 Gurdwara, Noida with devotion and enthusiasm by about 15 ,000 Sikh Sangat of Noida. Police said the body of Aruf Mandal was found from an apartment near their Raghuvir Nagar home, close to Rajouri Garden area on Saturday afternoon. “Aruf went missing on Wednesday while he was playing outside his home and investigations were immediately taken up on the complaint of the victim’s father Shankar Mandal, who runs a small textile factory in a nearby area,” said a police official. According to the police, several ransoms calls demanding Rs 200,000 for the child’s release were made to the victim’s house from various locations in Delhi and Uttar Pradesh on the same day. But the abductors could not be traced as they kept changing their location. “During investigations, Azad, who had worked at Shankar’s factory till two months ago, confessed his involvement and was arrested subsequently. In his interrogation he disclosed that he killed the boy on Wednesday and to mislead police he had asked his five accomplices to make ransom calls from Badarpur, Faizabad, Barabanki and Lucknow,” the official said. Some plan to dedicate a day to a particular cause, while others want to start new initiatives. The ultimate motive is the betterment of the society at large, a society where 28 per cent are still below the poverty line and 30 per cent are still illiterate. Babu Mathew, country director of ActionAid India, an international development agency, said that his organisation this year would like to bring to attention what he called the Indian state’s failure to distinguish between human rights activism and the Maoist movement. “Besides a whole lot of activities in various fields such as — education, poverty and environment, to name a few, in which we already work, we would like to draw the attention to what we learnt in 2007,” Mathew told IANS. Ranjana Kumari, director of the Centre for Social Research (CSR), said the focus of the CSR in 2008 would be on the plight of women in India. “Although we have not zeroed in on the date as yet, some time early this year we are planning to observe a National Shame Day throughout the country,” Kumari said. 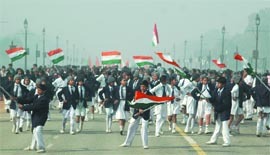 Various NGOs working on the issues of children plan to continue fighting for their cause, advocating and sensitising both the government and the masses about their plight. Kailash Satyarthi, chairman of the Bachpan Bachao Aandolan (BBA), an NGO which works for the uplift of street children and rescued child labourers in India and South Asia, said that an amendment or a new law on trafficking for forced labour would be his group’s demand and focus. “In 2008, our focal demand to the government of India is to either amend the old law or implement a new one on trafficking for forced labour. Till now the trafficking law only has commercial sexual exploitation in its purview,” Satyarthi said. “Also, we would like to make people aware of those areas where trafficking is very high. About 50 districts in Chhattisgarh, Orissa, Madhya Pradesh and Bihar are the most trafficking prone,” Satyarthi said. Rajib K. Haldar, executive director of Prayas, another NGO that works for the benefit of street children, said encouraging the role of the voluntary sector for better governance was going to be the aim of his organisation in 2008. “We will try to involve the voluntary sector more to work for the cause of children. Also, we will strive to get the views of children towards all the programmes and initiatives tailored for them,” Haldar said. Redesigning its programmes, opening more centres and tying up with other organisations - Etasha, an NGO that trains school dropouts and helps them get jobs in the hospitality industry has a lot of plans too. “Until now, we have been concentrating on the retail industry and all our students have been absorbed after completion of their course. But, now, we will redesign our other programmes for hospitality, domestic call centres and the data entry industry, so that more and more of our students get absorbed in these sectors as well,” Meenakshi Nayar, chairman of Etasha, said. Members of Goonj - an NGO that works for resource mobilisation turning one’s waste into another’s amenity - plan to involve more people in donating clothes, books, toys and other such material for the benefit of the needy. Operating in 19 states across the country, Goonj has a number of collection centres where people can come and donate. “The initiative that we started in 2007, the concept of Cloth Day on January 1, has been a huge success. On this day, we urge people to donate at least one piece of cloth to the needy and start the New Year on a different note,” said Anshu Gupta, founder of Goonj. Santosh Kumar, a trader, said that now getting an identification card for common man would become an issue. To prove one’s identity, it is necessary to keep an identity card while going outside. Officials may openly demand bribe for issuing identity card whether it is voter’s photo ID card, ration card or PAN card. Afzal Ahmed, a teacher, said that middle class people and others can manage to have identification cards but what would happen of those who do not have permanent residences. They work as daily wagers. They will be easy prey of beat constables and PCR men. He said, “In the Middle East countries, foreigners are issued an identification card and they are allowed to move in limited areas. But here it is being issued to Indian nationals. It is very funny,” he said. Sanjay Kaul, a member of United Residents Joint Action, welcomed the direction of the Lt-Governor saying that this checking should not be for limited period. This should be forever. The government should enact a law in this regard. Having seen terrorist activities, the government should be alert and it should make strong administration. As far as migrant labourers are concerned, they should be issued work permit so that they can be protected from any kind of harassment. All India Advocate Forum president M. K. Gandhi said that Delhi is a national Capital. Whatever happens here, it has larger ramification. In the past, a number of attacks by terrorists have been reported. Random checking of identification may help control terrorist activities. It will also help in maintaining law and order in the Capital, he said. In a letter sent by A K Pandey, additional director general of police, Intelligence, Punjab, to the Commissioner of Police, Delhi, Pandey has acknowledged that the security provided to Bitta needs to be reviewed in the light of the latest intelligence inputs received from the field units by his office. “Terrorists particularly those belonging to Babbar Khalsa International (BKI) continue to harbour the plans to eliminate M S Bitta. His stance against the Sikh as well as the Muslim terrorists, besides taking up the issue of hanging of Mohd. Afzal Guru and his utterances against the fundamental Sikh and Muslims outfits has increased the threat perception to his life,” says the letter. According to intelligence reports, there is a very strong possibility of an attack on Bitta at any place including the convoy, place of meeting, his place of stay and that threat perception particularly emanates from the use of explosives/bomb blast. The punjab government is also sending necessary advice in this regard to all senior superintendents of police in the state. Bitta had recently lodged a complaint in the Parliament Street police station in the wake of threat calls that he had received on his mobile from a Gulf country. According to the police, the incident occurred on Friday-Saturday night, when five to six men thrashed Om Prakash, 55, his wife, Azado, 50, their daughter Rekha, 28, and son, Narender, 23, with iron rods after entering their house by scaling a wall. There were some unconfirmed reports that the husband and the wife were also attacked with knives, after the duo tried to protest. All four were sleeping in the same room when they were attacked. The police said that after beating the family members, the assailants decamped with Rs 6,00,000 and some jewellery. The injured were admitted to the Maharaja Agrasen Hospital, where the conditions of Om Prakash and his wife were stated to be critical. Rekha, who broke one hand, and his brother Narender, who suffered minor injures, were discharged after treatment. Another son Kuldeep remained unscathed, as the robbers had bolted the room where he was sleeping. Kuldeep alleged Rekha’s husband Pramod was behind the assault and robbery, according to the police. “A few days ago, Pramod had an altercation with our family over dowry and we strongly suspect he is behind the incident,” Kuldeep said. Chief Minister Sheila Dikshit today launched a national immunisation drive (NID) to make India polio-free, from her residence in the Capital. Elaborate arrangements have been made in the Capital for administering anti-polio drops to over 28 lakh children between the age group of 0-5 years. Health minister Yoganand Shastri informed that 9,000 polio booths would be set up tomorrow to administer the vaccine to children. Around 30,000 workers and employees of the health department would be deployed from 9:00 am to 4:00 pm to ensure the maximum reach of the vaccine. The workers would be stationed at all public places in the Capital.Besides, a door-to-door weeklong survey would be conducted under the search and immunisation pulse polio campaign. Over 17,000 workers would visit colonies including, slums and JJ Clusters, in teams, to administer polio drops to those children who could not be administered with the vaccine. Expressing her concern over the disease, Dikshit said that her government would strive to eradicate polio from the NCT of Delhi. She informed that the government would focus on the eradication of the P-I poliovirus. The P-III virus would be eradicated in the course of action. While, the P-II virus was eradicated in 1999. Of over 667 polio cases reported in the country in 2006, 600 were caused due to the P-I virus. The country reported 592 cases in 2007, as against 676 in 2006. The assistant director was caught red-handed while demanding and accepting a bribe of Rs 2,000 from the complainant for giving him an early date for execution of conveyance deed. On the other hand, Pollution Test Inspector of Transport Authority, Burari, was caught accepting a bribe of Rs 8000 from an auto rickshaw owner for issuance of no dues certificate. With the theme ‘Engaging the Diaspora: The Way Forward’, PBD 2008 will have five plenary sessions covering areas like — investment, infrastructure, trade and business opportunities, diaspora philanthropy and eight working sessions on issues like — knowledge economy, women empowerment and culture. Ravi said that Chief Ministers of seven states, including Delhi’s Sheila Dikshit, Gujarat’s Narendra Modi, Orissa’s Naveen Patnaik, West Bengal’s Buddhadeb Bhattacharjee and Jharkhand’s Madhu Koda are expected to attend the event. “We are inviting the Chief Ministers to interact with overseas Indians. We are providing a platform to the Chief Ministers, so that they can highlight the investment and partnership opportunities in their states,” he said. Ravi also said that three important initiatives announced by Prime Minister Manmohan Singh during his inaugural speech at PBD 2007 - on a PIO (person of Indian origin) university, a Council for Overseas Employment Opportunities, and an Overseas Indian Facilitation Centre (OIFC) - have been fulfilled. “I am happy to report to you that my ministry has fulfilled all three commitments. In PBD 2008, the Prime Minister will be launching an overseas Indian resource centre, a helpline for emigrant workers... The Pravasi Bharatiya Kendra model will be constructed for the benefit of NRIs. He is expected to announce measures for the welfare of NRIs at PBD 2008,” Ravi said. On the OIFC, a one-stop shop launched last year to help overseas Indians invest in India, the minister said that the central government had been receiving a large number of queries, which have been responded to within 24 hours. This year, Mauritius Prime Minister Navinchandra Ramgoolam, a PIO, will be the chief guest. Twelve cabinet ministers including Pranab Mukherjee, Kamal Nath, Priya Ranjan Dasmunsi, Praful Patel and Renuka Chaudhary will address the delegates at PBD 2008. Malaysia’s minister for works S. Samy Vellu, Canada’s minister for small business and entrepreneurship Harinder Thakar, Fiji’s minister for finance Mahendra Chaudhry, Trinidad & Tobago’s former prime minister Basdeo Pandey and Mauritius’s foreign minister Madan Mulidhar Dullo will also be in attendance. Other prominent overseas Indians scheduled to address the event include House of Lords member Lord Karan Bilimoria, president of Indus Attorneys Anu Peshawaria, chairman of Global Organisation of People of Indian Origin (GOPIO) Thomas Abraham and deputy mayor of Durban councillor Logie Naidoo. Mayawati would be the first Chief Minister of the state to visit Greater Noida. No Chief Minister has ever addressed a public meeting in Noida or Greater Noida during the last 13 years. 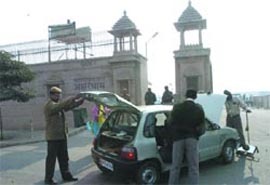 The district administration and police are busy making foolproof security arrangements for the Chief Minister’s official visit to the area, though she had visited Noida in her personal capacity on November 21, 2007. It is said that any Chief Minister who addresses a public meeting here loses his/her chief ministership within six months. The Chief Minister is scheduled to inspect Gautam Budh University, her favourite project. She will also lay the foundation stone of Ganga Expressway near Amarpur and Jaganpur village. The District Magistrate and the SSP had inspected the site of foundation stone and of Ganga Express and the ground where the CM will address the public rally on Friday. Over 50,000 people are expected to hear the Chief Minister address the public rally. Mayawati is also scheduled to address a press conference at 3.30 p.m. in New Delhi. Though it is not clear whether she would come by road. A helipad is also being made ready in case the Chief Minister choses to come by helicopter. Four bandits, equipped with daggers and firearms had knocked at Pradeep Agarwal’s bungalow on Railway Road in posh Ganga Vihar colony, Hapur at 4.30 pm on Thursday. When Mrs Agarwal opened the door, she was overpowered by the robbers who then decamped with jewellery, cash and valuables worth Rs 12 lakh. Police were informed of this daring robbery after about two hours. Late in the evening, SSP and SP Rural reached Agarwal’s bungalow along with a dog squad from Ghaziabad. Agarwal’s brother Satinder Kumar is the president of City Udyog Vapar Mandal. Pradeep Agarwal, proprietor of a factory manufacturing parts of railway engines and partner in Satyam Fashion Institute, Greater Noida, was at that time in his factory situated at Pucca Bagh. Both his children were also away to Ghaziabad while his wife Sadhna Agarwal was alone at home. While one robber had got the door opened, four others quickly barged into the house, pushing Mrs Agarwal aside. When she resisted, she was stabbed with a knife and later dumped in a bathroom after being tied with a sari. Later bandits, while fleeing with jewellery, cash and valuables, bolted the door from outside. At about 7 pm, Pradeep Agarwal’s partner, Dr Mishra knocked at the door but there was no response. After seeing the bedroom strewn with belongings, he informed Agarwal. Wounded Sadhna Agarwal was then rushed to a hospital and police informed. He returned home on Thursday. Abhilash, son of a BSNL employee, spent 18 days in terrible, inhuman conditions. The abductors demanded Rs 2 million (Rs 20 lakh) as ransom but the police said no ransom has been paid. For Babita, the mother of the boy, no gift in the world could have been better than the safe return of her son, one day before her birthday on Friday. Navin Arora, senior superintendent of police told the media that it was the pressure from police that eventually compelled the kidnappers to release Abhilash. “The gang members have been identified and they would soon be behind bars,” Arora said. According to police, three gangs of kidnappers are active in the ravines of Yamuna and Chambal adjoining Bah area of Agra district. “All the three gangs seem to be operating in close coordination, forming a network and helping one another,” a source said. Abhilash is lucky to have returned, but five other families are still waiting for their children to return. Suryansh was picked up ten days ago. His parents and their sympathisers in Agra have been regularly demonstrating and meeting officials to secure Suryansh release. “Akshay has given three hits last year, but he hasn’t superseded Shah Rukh. As far as popularity and collections are concerned, Akshay has come a long way, but Shah Rukh is phenomenal. His ‘Om Shanti Om’ has touched the Rs 900-million mark,” Vikas Mohan, editor of trade magazine Supercinema, told IANS. But Akshay is not competing with Shah Rukh and Amitabh Bachchan any longer. After the success of ‘Bhool Bhulaiyaa’, trade pundits are comparing him with southern star Rajnikant. ‘Bhool Bhulaiyaa’ is actually as big a hit as Rajnikanth’s ‘Chandramukhi’, from which it was inspired. Rajnikant’s ‘Sivaji - The Boss’ made waves by grossing about Rs 150 crore. He is charging a whopping Rs 16 crore per film, post the mega success of “Sivaji”. Similarly, after giving four hits in row – ‘Heyy Babyy’, ‘Namastey London’, ‘Bhool Bhulaiyaa’ and ‘Welcome’, Akshay has hiked his price and signed the next film with Venus Records for Rs 22 crore. “It is true that Akshay has hiked his price. He has signed the new Venus film for more than Rs 200 million and apart from that, he will have 54 per cent share in the film’s total profit,” Mohan said. The new deal perhaps puts Akshay in the league of the highest paid actors like Shah Rukh and Hrithik Roshan in the industry today. Many feel that Akshay is a one-man industry on his own. “Akshay is running his own parallel industry. His box-office record is impeccable. You cannot even call him the numero uno because he is far beyond that now in the box office race,” a trade expert said. Some call him the Hindi film industry’s hit machine. The box-office collections of Akshay’s ‘Welcome’ in the overseas have surpassed those of all erstwhile solo Akshay titles, creating a new record for the actor. In the UK, the preview and opening weekend gross was a smashing 3,70,000 pounds (approx) from 40 locations. In the UAE, Kumar grossed nearly the earnings of all his earlier hits in five days. The business to date is 1.8 million dirhams from 29 locations. In the US, the first two days grossed $100,000 from the mainstream theatres alone, independents excluded. Watchers said it was “extremely impressive”. In almost every mainstream location, ‘Welcome’ out-grossed major Hollywood openers like — ‘War’, ‘I Love You’ and ‘Walk Hard: The Dewey Cox Story’. “Three previous hits and with ‘Welcome’ setting records now, 2007 has been a year of box-office fortunes! I’m glad that I’m ending 2007 on a high note with ‘Welcome’, my highest overseas opener,” Akshay said. If last year was dedicated to comedies, 2008 will see him going back to his original genre — action. In Nikhil Advani’s new action-adventure-comedy, ‘Chandni Chowk To China’, Akshay will see him doing edge-of-the-seat stunts. The actor, who was out of practice for more than seven years, trained in a form of martial arts known as Wushu for the film. The movie will cost Rs 100 crore and that makes it one of the costliest Hindi films so far. Raman, a resident of Sector Beta-I was coming from Noida to Greater Noida on his motor bike on Thursday. Near Kulesra, three criminals beat him up and deprived him of a gold chain and cash. Raman promptly informed Surajpur police about it. Police were able to nab criminal Kuldip during combing operations in the night. During the night, the robber was interrogated and in the morning on Raman’s request, police registered a case of assault and loot against the robbers. After a while, the accused said he wanted to go to relieve himself. Cops Kuldip and Luca were sent with him. Finding a suitable opportunity, the accused escaped from back compound after scaling the compound wall. When the cops went to bring him back, they were shocked to find that the accused has escaped. The Sector-18 Singh Sabha Gurdwara has tastefully decorated and spruced up for the occasion. From early morning Sikh Sangat and others were seen thronging the shrine. Shabad Kirtan was presented by Hazoori Raglis, Bhai Mukhtar Singh, Bhai Aman Deep Singh, Bhai Jasbir Singh and Bhai Jagjit Singh Komal while Gurmat Vichar was presented by Bhai Narinder Singh, head granthi, Bhai Amarjeet Singh and Giani Sahib Singh, head granthi. Dhadi Jatha of Bhai Kehar Singh Noor and Shabad Kirtan by students of Gurmat Vidalya also presented. Guru Ka langar was served in the afternoon as well as at night.